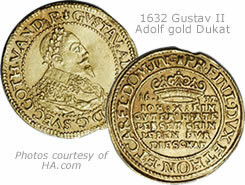 In an unusual case, a judge decided that one of five stolen Swedish rare coins purchased at a garage sale — a Swedish 1632 Gustav II Adolf gold Dukat — would be returned to the daughter of the woman who bought them, and not to the owner’s estate who received the other four. “This case raises squarely the conflict between two principles, protection of property and protection of commercial transactions,” said British Columbia Supreme Court Justice Bruce Butler who ruled to split the coins. To better understand Justice Butler’s decision, background information provided in the case offers an excellent history of events. Marina Ovsenek was on her way to a cancer treatment with her daughter, Stephanie Manning, when they happened by a garage sale sign. They decided to stop, and Ms. Ovsenek bought a box containing five gold-colored coins and a brooch for $5. Ms. Ovsenek died four years later and her husband gave the coins to Ms. Manning in 2005. Her agent eventually contacted a coin museum in Sweden to inquire about possibly selling the coins. A short time later, West Vancouver police confiscated the coins and Ms. Manning learned they were stolen. The coins were returned to Swedish collector Klas-Olof Algard, who passed away shortly after but had reported and provided a statement in 1994 to police that his briefcase with coins were stolen. Court filings indicate Mr. Algard provided police information about the theft on at least three occasions, and then gave another statement after the coins were seized from Ms. Manning’s agent. However, the statements contained conflicting information — to include differing quantities of stolen coins, ranging from seven to four and then five coins. Ms. Manning initially sued the police in attempt to get the coins back. After learning they were given to Mr. Algard, her suit was modified to include his estate for their recovery, and the claim against the police was dropped. "Ms. Manning says that her mother was a bona fide purchaser for value of the coins and that she is now the rightful owner of them." "Mr. Algard’s statements to the West Vancouver Police are hearsay and are not admissible in evidence. If that is the case, there is no way for the estate to prove that the coins were lost by or stolen from Mr. Algard, and Ms. Manning’s claim to the coins must prevail"
Mr. Algard’s estate had a different perspective. "Mr. Algard’s estate says that the coins were lost or stolen in 1994 and that he retained legal title to the coins at all times so that the estate remains the owner of the coins." At issue, Justice Butler has to rule whether Mr. Algard’s written 1994 and 2005 statements were admissible. And if so, who had better title over the coins — Ms. Manning or Mr. Algard’s estate. The situation was further complicated given Mr. Algard’s passing, making it impossible for him to clarify the discrepancies between statements. In the end and after weighing the evidence, Justice Butler decided the 1994 statement that indicated four coins were stolen was admissible, and the 2005 statement was not. With an absence of ownership proof and based on the 1994 statement, Justice Butler ruled. "I can infer that the [fifth] coin was lost with the other four coins. However, I cannot infer on the basis of the admissible evidence that it was owned by Mr. Algard, " concluded Justice Butler. "There is simply nothing in the record that permits me to do that. Ms. Ovsenek purchased the coin in good faith and without notice of any defect in title. The estate has not been able to prove that Mr. Algard had title to the coin," Butler said. In the end, Ms. Manning regained ownership of the rare Gustav II Adolf gold Dukat that her mother paid $5 for in the garage sale. Stolen Rare Coin beolng one who brought coin! Because buyer paid for it! We call it buyer keeper! I can easily accept that a stolen coin should be returned to it’s rightful owner (or their estate), but what evidence did they have that these were THE stolen coins? Did they have photographs, or was it based entirely on description? Rarities are found. How could it be determined that these were the coins which were stolen, and not family heirlooms which were neglected for generations, just to end up in a jewelry box?